DALLAS, TX — With the launch of www.HA.com/Connect Heritage Auction Galleries has now placed its bidder-members and followers right in the middle of the world Social Media boom. 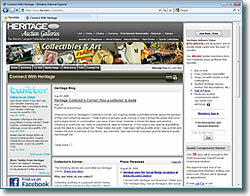 The recent additions of a Heritage Auction Galleries page on Facebook, where all the latest press releases and pertinent announcements from the company are posted, complimented with frequent updates from Heritage on Twitter.com and daily postings on The Heritage Blog, make it easy for Heritage users to follow the day-to-day media happenings at Heritage Auction Galleries. You can view a compete archive of Heritage press releases at www.HA.com/PR. Besides updates regarding the latest press releases, prices realized and special lots, visitors to the Heritage Social Media page will also be able to follow Halperin via his Twitter account, receiving updates and insight from one of Heritage’s co-founders. "The increasing power of social media is impossible to ignore in this day and age," said Jim Halperin, Heritage Co-Founder. "Heritage has always been in the forefront of technological innovation, and we intend to continue leading the way among major auction houses with our social media initiatives." Heritage Auction Galleries is the world’s third largest auction house, and by far the largest auctioneer of rare collectibles, with annual sales more than $700 million, and 450,000+ registered online bidder members. For more information about Heritage’s auctions, and to join and gain access to a complete record of prices realized, along with full-color, enlargeable photos of each lot, please visit www.HA.com.